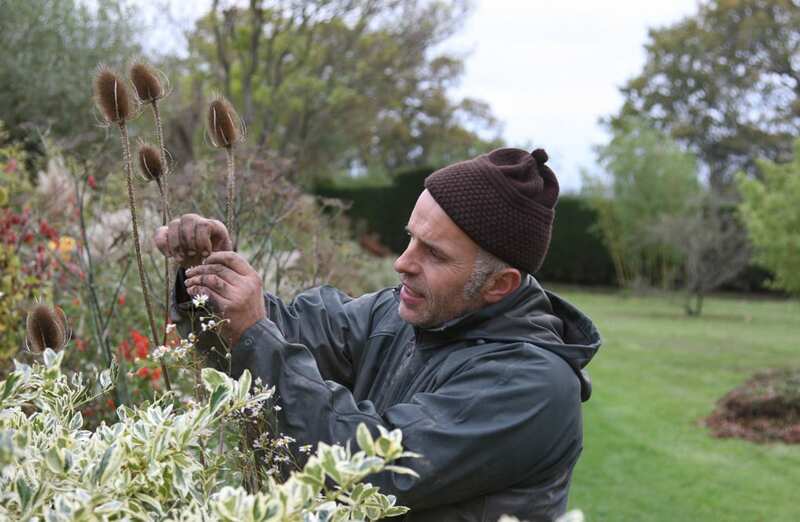 Fergus Garrett, Headgardener at Great Dixter, photo by Great Dixter House & Garden. As garden designers, we are always looking for inspiration from and outside our industry, and is not uncommon to find us here at Ann-Marie Powell Gardens headquarters chatting animatedly about the latest exhibition, show or garden we visited. I personally love to draw inspiration from the past and reinterpret it to suit modern lifestyles. When friends and colleagues ask me to suggest a garden to visit, there is one that always features on top of my list, as it never ceases to surprise and inspire me: Great Dixter in East Sussex. If asked why, I am afraid I could go on and on for hours on what I consider the equivalent of a garden Mecca… but conscious you might be reading this while catching the next train home, I will limit myself to my top three favorites, hoping you will want to see the rest with your own eyes. 1)This paving detail of the blue garden, under the hundred-years-old and-counting espalier. Call me odd, but there is something of this Edwin Lutyens’s feature that always stops me on my way to the Sunken Garden. Maybe is the feeling of handcrafted tiles paired with the old Yorkstone, maybe is the texture and contrasts of these two materials accentuated by the creeping Soleirolia soleirolii, or the visual link to the matching pergola nearby , but you can be sure that at every visit you will find me there, pondering how to translate such a beauty to modern-day designs. Enthusiasm and will to share their knowledge oozes from the eyes of anyone who works or volunteers at Great Dixter. I will never praise enough the work of the entire team under the painstaking stewardship of Fergus Garrett. If I’ve tempted you enough to pay a visit to Great Dixter, I hope I will see you this coming weekend at its Autumn fair, not the biggest but surely one the best plant fairs of the country in my opinion. I will be very easy to spot: I will be the one trying to juggle a baby, an enthusiastic toddler, and my brand new collection of ‘I cannot live without those’ plants. You see…I MUST try these out on behalf of our clients…right? !